The first edition was published in 1956 as a book by VDI-Verlag. The VDI Heat Atlas, the standard work in Europe for the calculation of heat transfers, physical properties and flow problems, is now available in its 11th edition. Its structure concentrates on a comprehensive theoretical description of the most important basic process operations on which the various processes are based. Many authors from research and industry have contributed to the preparation of the individual chapters and sections. As a text part (book or eReference) a German version (11th edition) and an English version (2nd edition) are available. Both can be procured inexpensively by us. What can the LV calculation program do? Since the 5th edition, the individual chapters have been licensed as calculation programs by Lauterbach VT and have always been adapted to the current editions. Currently the programs run under Windows 7, 8 and 10 / 32 and 64 bit.. 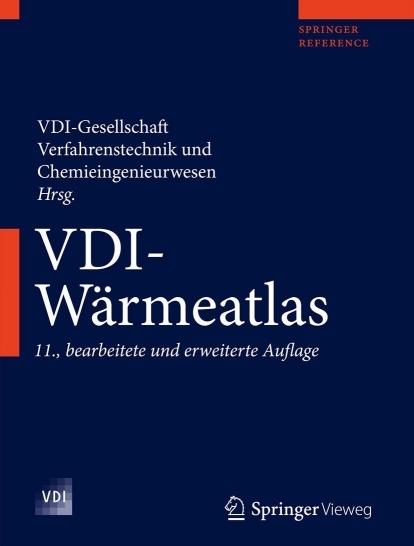 There is also an English full version of the German program LV-VDI-Wärmeatlas. The ATLAS modular system made the practical application of the chapters and their combinations into processes much easier. Each chapter corresponds to a module. These modules can be integrated into the individual problem,e.g. in MS-Excel,and extended by own calculation equations. Individual modules are mapped in individual tables, the reference of the respective variables is established by simply dragging the mouse. The VDI Heat Atlas is interactively available to the user. The equations are displayed with the current input values. The data of the individual chapters can be connected by simply dragging and dropping them. The authors have partially restructured the content of the chapters and incorporated the latest research findings. All chapters have been renamed. Some chapters have not been implemented because they are text, tables or incomplete specifications. Modules that are very special or for which there is little demand have been removed in order not to unnecessarily increase the price of the VDI Heat Atlas package. Some modules can be supplied as supplements. The following modules from previous editions were removed by the authors. To the price list! Simply order bye-mail!